Sterilite's Portable File Box is an ideal solution for organizing the current year's tax documents. Letter size hanging file folders fit perfectly in this box and the durable latch ensures the contents remain safely contained all year long. The spacious in-lid storage compartment is great for storing small items that need to be easily accessed such as paper clips, post its, and pencils. The sturdy handle allows for comfortable carrying, which makes it easy to transport back and forth from your accountant's office. If you would like added security, the Portable File Box accommodates a standard padlock. Below are some suggestions of how to organize your file box that you can customize to your needs. Write the different categories on the tabs of the file folders so you can easily identify your documents. Once your taxes have been submitted to the IRS, transfer your documents into a File Box for long term storage, using the same subset of hanging folders. Keep in mind that tax guidelines recommend you keep all of your tax returns as well as seven years of receipts in case you are audited. Using a file box for each year's taxes will help organize and centralize these documents for future reference. 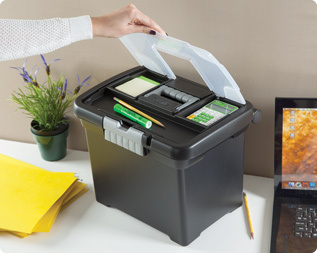 Sterilite's File Box conveniently accommodates both letter and legal size file folders and the lid hinges to the base so it will never be misplaced. Its contoured contemporary design provides a comfortable grip area for easy portability and it features a durable latch that will keep your documents secure. Multiple file boxes are able to stack neatly on top of one another, helping to maximize space in a home office or closet. Be sure to label the outside of each file box to make locating documents easier. It will also help with identifying contents when it comes time to purge items that are dated or no longer needed. So what are you waiting for? 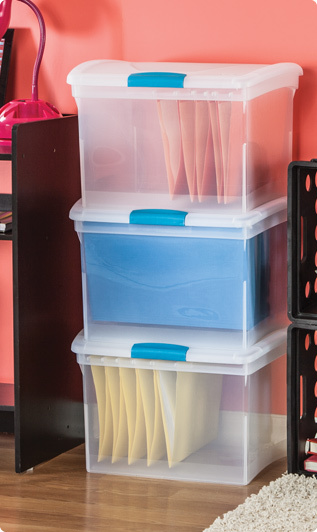 Utilize Sterilite's file boxes to establish a filing system for your taxes. You will be thankful next year when you do not have to spend hours pulling together all of your tax documents at the last minute! This in-lid storage compartment is great for storing small items. Our file boxes stack perfectly on top of one another to maximize space.